The Obama administration, in its last few months of office, has been criticized by both human rights activists and members of the United Nations for supporting the Saudi military airstrike campaign (otherwise known as “war”) against the country of Yemen. The reasoning for the military support, the U.S. claims, is due to the rise of Iran-aligned Houthi rebels, who recently fired missiles at a U.S. warship, the USS Mason, off the coast of Yemen on the 9th and 12th of October this past week. In response to the funeral attack, the Houthi rebels fired again at the warship on Saturday. 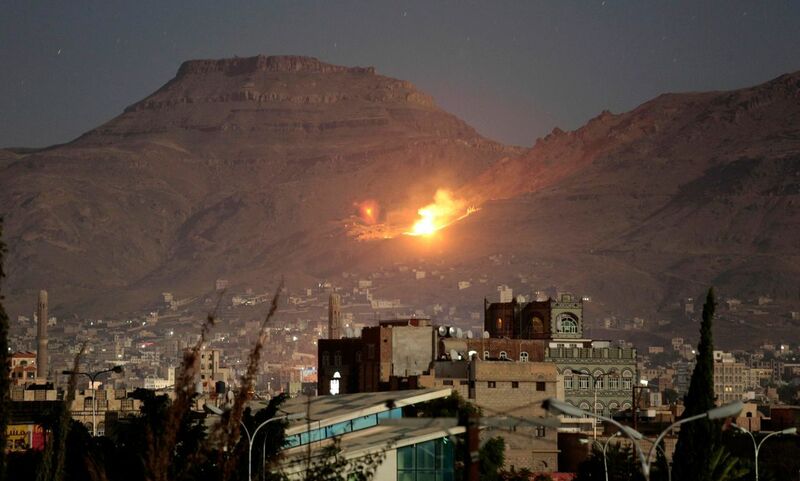 The funeral attack was reportedly due to false information given to the Saudi-led coalition who performed the attack. They’ve also been accused of not following the proper procedure for rules of engagement in military combat, as outlined by the United Nations, which seems to be a problem the coalition has. Just over a year ago, the same Saudi-led coalition accidentally attacked another funeral killing 20 people. A senior Houthi official, Mohammed Atbukhaiti, explained that the figures reported by the United Nations (roughly 150 dead from the funeral attack) showed how the coalition is “disorganized and reckless” and treats “the lives of the Yemeni people in a careless and disrespectful manner. This has not been the first incident where the Sandi-led coalition has targeted civil gatherings, killing and injuring large numbers of civilians,” he said. Meanwhile, not only is the U.S. sending money to Saudi Arabia every year for anti-terrorism efforts and nation building, but the middle eastern country owns about $117 billion of American debt, ranking #13 on the list of countries storing their money in U.S. treasuries, which they had threatened to sell off in April this year, which would have tanked the U.S. securities market, though it appears to be an empty threat as it would also do irreparable harm to Saudi Arabia’s market as well. Yemen is widely known as the Middle East’s poorest country, ranking 140 out of 182 countries on the UNDP Human Development Index in 2009, with an estimated 42% of the population living in poverty and 20% of the population being malnourished and starving. Under a president Hillary Clinton, Yemen may see an even higher poverty rate as tensions continue to rise between the four countries involved in the conflict. It was Clinton, as Secretary of State under Obama’s first term in office, who got the world to stop buying oil from Iran in response to their non-compliance with UN weapons inspections just a few years ago. This caused Iran’s economy to implode after a decade-long trend of decreasing poverty since oil exports are the country’s chief source of income. When Iran finally agreed to allow weapons inspectors in (who found nothing), Clinton said she wasn’t satisfied and threatened more oil sanctions, despite the effect these sanctions had on Iran’s economy.